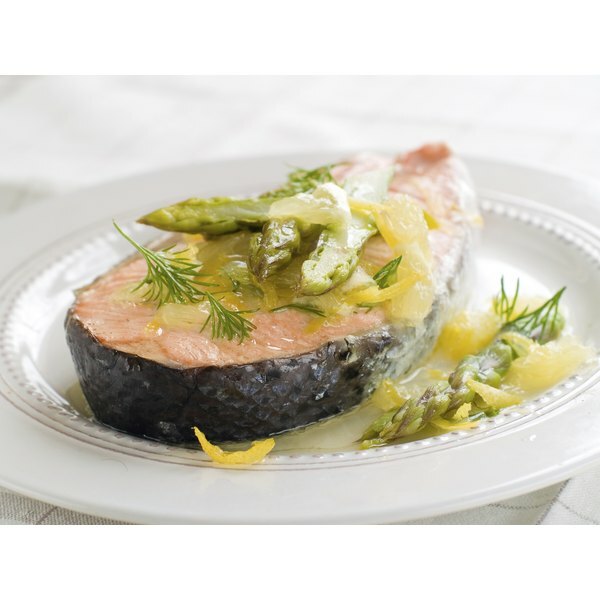 Poached salmon topped with fresh lemon and asparagus. Salmon is a wonderful source of vitamins and nutrients, and an essential part of a healthy diet. It is high in Omega-3 fatty acids, which can reduce inflammation and improve skin tone and texture, while also being high in protein that helps fuel muscles and give the body energy. Salmon is a flaky, pink fish that is recommended 2 to 3 times per week for maximum nutrient benefit. According to dermatologist Dr. Nicholas Perricone, eating an "inordinate amount of wild salmon is suggested for obtaining essential fatty acids." Dr. Perricone recommends wild salmon specifically because "it is by far the richest food source of astaxanthin...a very potent carotenoid-class antioxidant with strong anti-inflammatory properties." Salmon can be greatly beneficial in lowering cholesterol levels, because it has heart-healthy Omega-3 fatty acids, which reduce internal inflammation and support overall cardiovascular health. There are two kinds of cholesterol in the body --"good" cholesterol (HDL) and "bad" cholesterol (LDL). The vitamins and nutrients found in salmon has been shown to increase healthy cholesterol levels (HDL), which is why the fish is greatly recommended for a cholesterol-lowering diet. The Food Source website states that "studies have shown that HDL levels were increased by 10 percent, just by eating a high salmon diet for 20 days." In general, eating any form of Omega-3 fatty acid fish during the week will help boost HDL levels and lower bad cholesterol. Try to make lean salmon a protein priority, but add variety with other fish such as tuna and additional anti-inflammatory foods like nuts or colorful berries. However, studies have shown that eating fresh and natural sources of salmon is recommended far more than taking fish supplements for lowering cholesterol (although an Omega-3 pill is never discouraged as part of a well-rounded diet). Although salmon is full of potent vitamins and healthy fats, it is easy to go overboard on calories if you're unsure of proper portion size. When in doubt, cut a piece of salmon to match the size of your own fist and that is the appropriate protein portion for your body. Try boxing up or setting aside the remaining amounts of salmon for another meal, or set atop a dark green salad for lunch the next day. Salmon can also lose its health benefits if prepared improperly, such as covered in fatty sauces, cream broths or lots of butter. Instead, try to always prepare salmon by grilling with some light olive oil, steaming or even eating raw in healthy sushi (and make sushi healthier by choosing brown rice instead of white). If cooking salmon is not your thing, a variety of brands offer frozen and packaged portions of fish that can be created in minutes, but check package labels to ensure the calorie content, sodium levels and additional ingredients are appropriate. If extra sugar, spices and fats have been added, skip the product in favor of fresh, natural salmon. Another surprising source of salmon is fish from a bag or can, which still maintains and preserves vitamin levels as long there are no additional additives. What Are the Benefits of Steamed Fish? Can I Eat Sushi Twice a Week?